Anyway, enough about that. With any luck I'll be back tomorrow with the companion card to this one. Have a great day! Oh wow Cheryl this card is stunning! I love that cool bird and the way you put your cards together is just perfect. The colours and everything are superb! Love this card Cheryl! The whole scene is great. That rose is really pretty to. WoW! I love it! I like the decorative stamp in the middle of the oval! Great Halloweeen card! Beautiful! I can't wait to see what you do next. 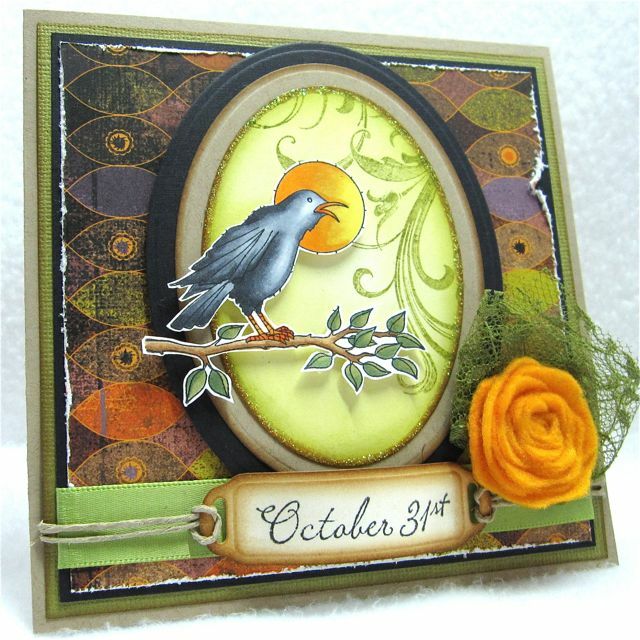 Great Halloween card, and that raven on the branch is terrific! 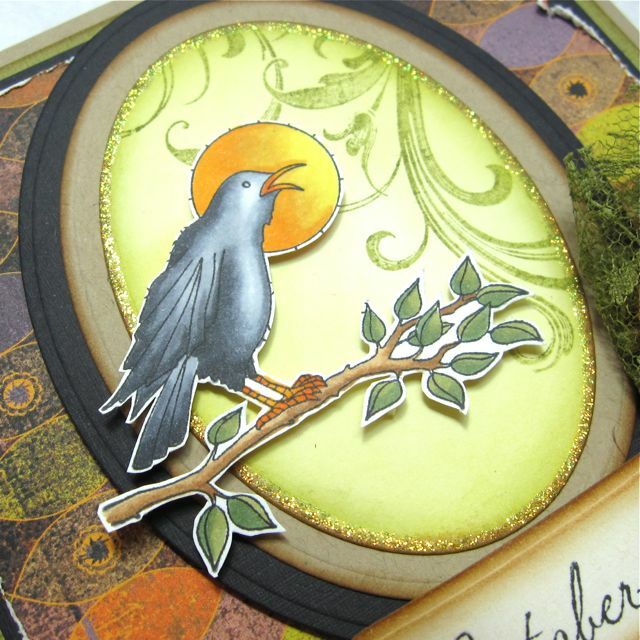 Love everything about this gorgeous creation! No really I'm not surprised your colouring is sublime!!! 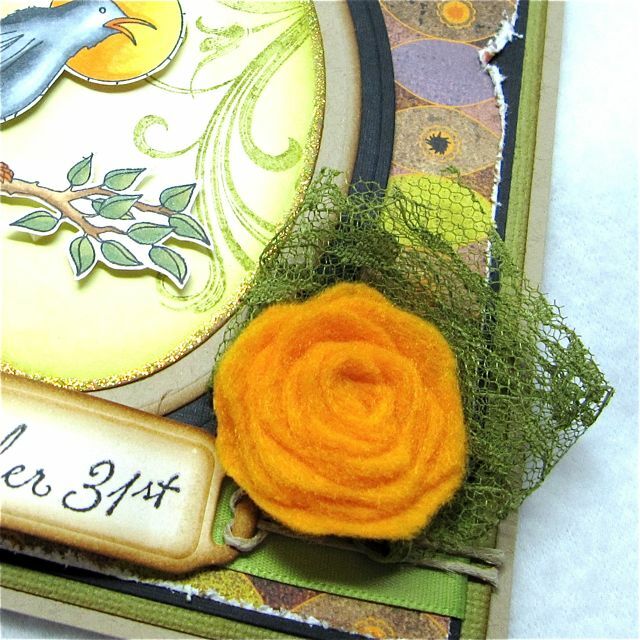 Love that felt rose did you make it yourself- if so need a tut!! I ADORE Halloween- my fave season!!! Fan-freakin'-tastic, Cheryl! You know I loves me some Halloweenieness, and this is a stunner! The card is really beautiful! I agree with you on the flourish... need to find that one! wow Cheryl...that's just gorgeous!! I LOVE it!! Awesome!! I could stare at your cards all day. Your composition is always spot on and I love the little touches like that felt rose! Congrats on being certified! Knew it would happen soon enough! The card is fantastic. I love the image and the flourish. Your felt rose is fantastic! Congrats on your Copic certification, though in truth, you could probably have taught the class! Wow, that is stunning and that rose is the perfect embellishment too! Lovely card!